Is There a Loyalty-Enhancing Effect of Retroactive Price-Reduction Schemes? 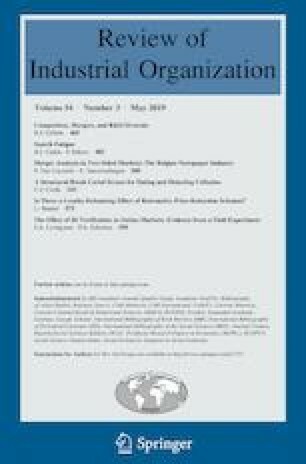 This paper presents an experiment on the effect of retroactive price-reduction schemes on buyers’ repeated purchase decisions. Such schemes promise buyers a reduced price for all units that are bought in a certain time frame if the total quantity that is purchased passes a given threshold. This study finds a loyalty-enhancing effect of retroactive price-reduction schemes only if the buyers ex-ante expected that entering into the scheme would maximize their monetary gain, but later learn that they should leave the scheme. Furthermore, the effect crucially hinges on the framing of the price reduction. I gratefully acknowledge financial support from the German Research Foundation (DFG), Grant BR 4180/1-1. The online version of this article ( https://doi.org/10.1007/s11151-018-9653-9) contains supplementary material, which is available to authorized users. I would like to thank Marco Caliendo, Dirk Engelmann, Miguel Fonseca, Jochen Gloeckner, participants of TIBER XII in Tilburg, the ESA European meeting in Heidelberg, the GfeW meeting in Kassel, and of research seminars in Bonn and Kreuzlingen for very helpful suggestions. Alexandra Haas and Jana Hamdan provided highly valuable research assistance. Today you will participate in an experiment. If you read the following instructions carefully, you can earn money. The amount you will get depends on your decisions and on chance, but not on the decisions of other participants. During the experiment, it is not allowed to communicate with other participants. Therefore, we ask you not to talk with each other. A violation of this rule leads to exclusion from the experiment and from any payment. Please read these instructions carefully. If you have any questions or if anything is unclear, please raise your hand. We will then come to your place. After the main part of the experiment, you will participate in a short lottery experiment. You will find the instructions for the second part of the experiment being displayed on your computer screen after the first part. This experiment consists of 3 times 20 rounds, i.e. after 20 rounds there will be a restart. At the end of the 60 rounds in total, we will add up all your earnings. During the experiment, we will count your earnings in points. The points you obtain during the experiment will be converted into euros at the following exchange rate: 800 points = 1 euro. At the end of today’s experiment, you will receive your achieved points converted into euros in cash. In the following, we will describe the procedure of the experiment in detail. First, we will explain the general procedure. After that, you will be given the opportunity to familiarize yourself with the procedure at the computer screen. Before we start the experiment, we will ask you to answer some control questions on screen, which will help you to understand the procedure. The experiment does not start until all participants are familiar with the procedures of the experiment and answered all control questions correctly. In this experiment you make decisions in the role of a retailer who buys a fictitious product and resells it. In each round, you can buy a predetermined amount of units of the fictitious product from one out of two suppliers and resell them to a buyer. Both the two suppliers and the buyer are not real participants in the experiment, but are simulated by the computer. Supplier 1 offers the product at a price of 60. If you buy at least 180 units in total from supplier 1 during the 20 rounds, you get a rebate of 10 points for each unit you bought from supplier 1. The rebate is paid back at the end of the 20 rounds. This means, you pay a final unit price of 50 to supplier 1 in this case. Supplier 2 offers the product at different prices. In some rounds you can buy the product from supplier 2 at a price of 25 points. In each round, supplier 2 will offer a price of 25 with a probability of 40%. With a probability of 60%, supplier 2 will set a price of 60. You will be informed about supplier 2’s current price at the beginning of each round before you make your purchasing decision. You will resell the units you bought from suppliers 1 and 2 to a buyer in each round. This buyer pays you a unit price of 60 points each. The buyer is ready to buy 10 units of the product for a price of 60. During the experiment a calculator program of the computer is available to you if you want to calculate the consequences of your purchasing decision in advance. You can open the calculator by clicking on the symbol next to the “OK” or “next” button. At the end of each round, you will again be informed about the prices and the quantities you bought in this round and in all previous rounds. Moreover, your profit from all rounds will be shown, and you receive information about the number of units you bought at each supplier so far.